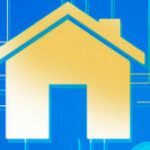 Your home router connects your home network to the Internet. Most home routers also function as Wireless Access points and are commonly called wireless routers. Home routers are usually supplied by an ISP (Internet Service Provider) as part of your Internet package. On the Internet side the router will may have a single connection labelled DSL which uses a RJ12 telephone connection. This connects to the telephone network via a broadband filter. On the Local side the router will have a Wi-Fi interface and Ethernet ports. The router shown above is my home router which has 4 Ethernet ports for wired clients, as well as supporting WI-Fi access. In addition most also have a USB socket for connecting the router to a computer for initial set up. Always remember to use the microfilter as without it it may not work or may only work intermittently. For fibre and cable use the WAN port on the Router to connect to your cable or fibre modem using an Ethernet cable. 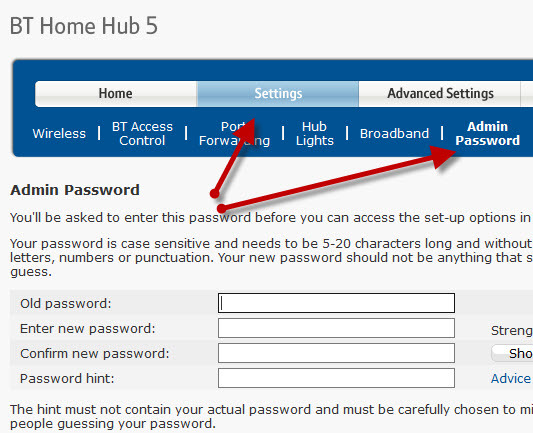 To change the configuration settings of the router you will need to login to the router. Using a computer connected with a USB cable. Using a computer connected with an Ethernet cable and a web interface. Almost all home routers can be setup and managed using a Web interface. i.e a web browser. To use this you will need to connect to the router using the Ethernet port or Wi-Fi . the SSID of the router, which should come with the documentation. (you can change the SSID later). 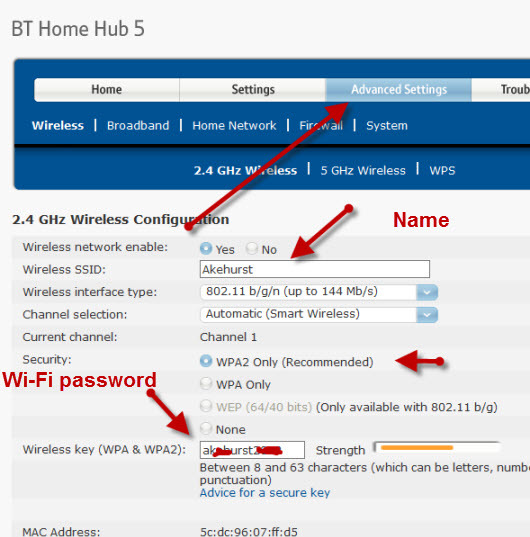 The first step is to setup Wi-Fi access on your Laptop/PC using the Wi-Fi details (SSID and password). Now you should be able to connect to the router, and the router should assign you an IP address. You can check your IP address and find the IP address of the router by using the ipconfig command. Open a command prompt an enter Ipconfig/all. Look for the default gateway. This is the address of your router. Common default addresses are: 192.168.1.254 , 192.168.1.1 and 192.168.0.1. To login open a web browser and enter the IP address of the router e.g. 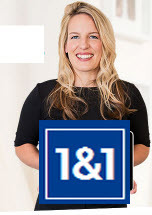 192.168.1.254. You should get a welcome screen or an overview screen as shown above. If you try to make changes you will be prompted to login. 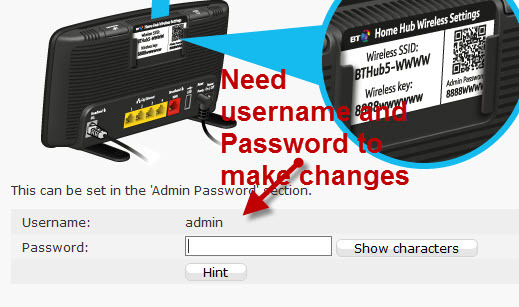 Once you are logged in you can change the router configuration. There are several things that you usually need to configure. Password for the DSL link. Note 1: I would recommend that you change the WiFi SSID and password and also the router admin password. Note 2: Changing some of the settings will cause you to lose the connection to the router, and so you may need to reconnect and login again using the new settings. It is a good idea to change this to a name and password that are easy to remember for you, but not easy to guess. In restaurant,hotels etc you often see the restaurant or hotel name as the SSID. Important! -When you change it you will lose the connection and you will need to change your laptop Wi-Fi settings to match the new settings. 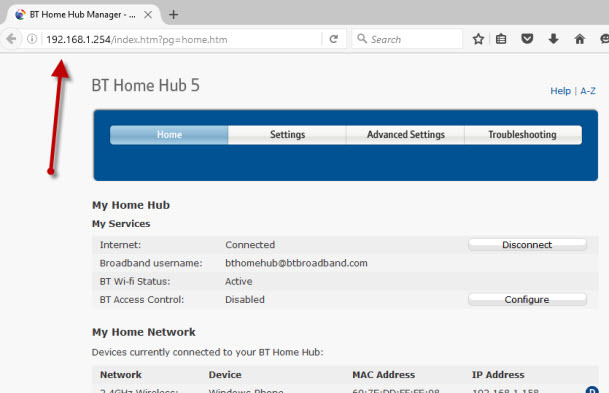 On the BT home Hub you will find the Wi-Fi settings in the Advanced section. It is important that you change this from the default value as if you don’t you leave your network open for security hacks. If you use a router that was not provided by the ISP then you will also need to configure the settings for the DSL connection to the ISP. Most of the time the Router can detect the connections type and will configure itself. All of the home network connections I have come across use PPPoe ( PPP over Ethernet). There is no need to worry about what it means, but the result is that you will need to provide a user name and password in order for the router to connect to the ISP. This user name and password is supplied in you ISP setup details. Provider (e.g. BT,talktalk ) dsl password third party router. One allows you to connect to the router (supplied by the router manufacturer) and the other allows the router to connect to the ISP (supplied by the ISP). Wireless networks are insecure, and if you live in a densely populated area you may find that you can see and access the wireless networks of your neighbours and vice versa. Because of this you should always encrypt your wireless connections. Wi-fi (2.4GHz band has 14 available channels however the standard channels used are channels 1,6 and 11. When choosing a channel for your Router/access point you need to take into account what channels are already being used in your location. If you live in a densely populated areas you will have many other access points with various signal strengths and may encounter interference. There are a number of test tools that you can use for viewing the Wi-Fi activity in your location. The one I prefer is the InSSIDer tool that runs on Android and Windows. You can download the free tool here for Windows and Mac and here for Android. The general idea is to choose a channel that has the least interference from other channels. Most wireless routers today will auto detect and choose the best channel. This is usually enable by default and if it isn’t enabled then you should enable it unless you are providing A DHCP service from another router. This is a very common setting if you have someone playing computer Games of if you need to provide external access to your home network. This setting can be potentially dangerous as it opens your home network to the Internet and it is covered in more detail the understanding port forwarding tutorial. However you should have an appreciation of PP addresses and the different types and so I recommend you read the Internal and External IP addresses tutorial first.